Michele has given thousands of readings over the years, and they are POWERFUL! When Michele begins to invoke the Angels and Masters, who will be working with you, most people feel a noticeable loving presence. You will be cradled in protective, compassionate wisdom, and guided from the highest Source. You will receive healing and deep transformation as well as clear guidance! Any life challenges you may be facing! Clients walk away from these sessions with renewed inner peace, the answers they've been looking for, and a clearer sense of purpose. Michele’s soul purpose is to inspire and empower, and this is exactly what her clients receive! If you're not sure what move to make, or what to expect next in life, these readings are for you! Michele is a direct conduit for the Angelic Realms of Light for spiritual messages as well as Ascended Masters, Christ Consciousness, and the Mighty I AM Presence. She may use angel cards, oracle cards or crystals during a reading to enhance your guidance. Sometimes, a deceased loved one will also come through with loving, healing messages! Michele will always allow Spirit to guide what is best for you! You may ask any questions you may have, and this is advised, so you get exactly what you are looking for. The Angels always say "You must ask us for what you need. We honor your free will and will not supersede that. By asking us the questions you want answers to, we are able to provide you with those answers and also guidance and assistance to help you in the most beneficial way." When you work with Michele, you are in a very Sacred space that is the presence of Angels and the Love and Light beings who offer you the most powerful insight and healing. Because Michele has a background in healing, you will also receive any healing energies that may be needed at the time. These readings are a holistic and healing experience!! *Readings are done over the phone, Skype, FaceTime or Zoom and are by appointment only. 30 minute emergency session $333 If you need a reading quickly, I offer a limited amount of readings that I can do within 48hours. I cannot guarantee that I can always be available (ie…. holidays, birthdays, vacations when I have taken myself off of schedule for personal down time…). That being said, I understand that there are times when you need support, and the Universe is always working to provide you what you need, I will always do my best to provide!! You can schedule using my scheduler by clicking right HERE If for any reason you have trouble booking through the scheduler, pleased text Michele at 949-202-7493 and let her know you need an emergency appointment and she will arrange an appointment and payment with you. 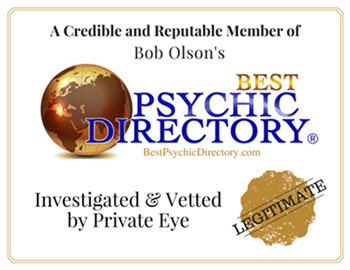 Michele is a verified Psychic through Bob Olson's Best Psychic Organization.